Hand-cut from Pennsylvania cherry, a hardwood with handsome color and grain that's smooth and strong. Imagine you're in a country kitchen a hundred years ago. Home-churned butter, resting on a handmade wooden board, awaits fresh-baked bread—or maybe pancakes drenched with maple syrup from out back. Jonathan and Julia Simons' lovely, homey butter board looks just as it would have back then. The timeless, folk art-style moon and stars silhouettes are hand-cut from fine Pennsylvania cherry, a hardwood with handsome color and grain that's durable, smooth, and strong. The distinctive blackened edges and designs, Jonathan and Julia like to say, are "sculpted by fire." 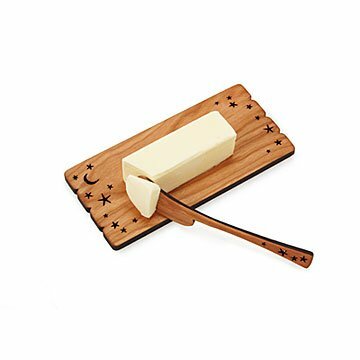 The lightweight cherry wood spreader won't slip out of the butter as it softens, like a heavier, metal knife would. Nor will it crush toast or bread as it glides across it to spread... what? Your choice: dairy butter, vegan versions, soft cheese, nut butters, jam, and dip. Yum. Handmade in Pennsylvania. Jonathan is an artist and furniture maker who started his craft over 35 years ago. Julia is an artist with a background in graphic design. When the two met, they decided to put their design ideas together, and sixteen years ago, they made their first carved utensil. All their tabletop designs are made from solid Pennsylvania cherry wood, using no dyes, resins, or polymers. They successfully experimented with laser cutting, which allowed them to develop more inspired and inventive designs, working in their Pennsylvania shop. Jonathan and Julia intend for their utensils to be used every day, and think of their item's usefulness as part of their art. Hand wash with mild dish soap. Condition with mineral oil.